The Splatfest Power of one's team is shown before battle. Power level also known as Splatfest Power, League Power or X Power is a feature introduced at version 2.6.0 in Splatoon that replaces the vibe meter during Splatfest. 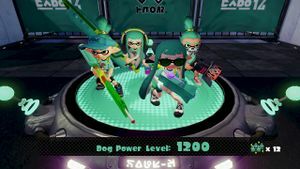 The concept of power level has also been extended in Splatoon 2 to apply to Ranked Battles and League Battles. The Power rating is a Glicko-2 rating system. Only wins and losses are considered when measuring performance in battles, meaning that splats, getting splatted, turf coverage and playing the objective don't count towards the Power rating. The opponents Power rating are put together to a single value and used when calculating a new value for the player. In addition to rank, and power, players also have a rating deviation (RD) number for each mode. The RD measures the accuracy of a player's rating, with one RD being equal to one standard deviation. For example, a player with a rating of 1500 and an RD of 50 has a real strength between 1400 and 1600 (two standard deviations from 1500) with 95% confidence. Twice the RD is added and subtracted from their rating to calculate this range. After a game, the amount the rating changes depends on the RD: the change is smaller when the player's RD is low (since their rating is already considered accurate), and also when their opponent's RD is high (since the opponent's true rating is not well known, so little information is being gained). The RD itself decreases after playing a game, but it will increase slowly over time of inactivity. 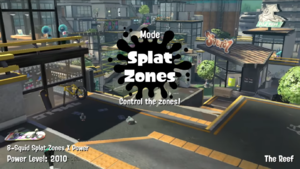 At version 2.6.0 in Splatoon, a feature was added to Splatfests that replaced the vibe meter to a Splatfest Power level meter. In Splatoon, Initial Splatfest Power level depended on player's current Ranked Battle rank. At version 2.7.0, the initial Splatfest power of player's who were in rank S+ was changed from 1600 to 1700, also the initial Splatfest power of players below level 10 was changed from 800 to 1000. In Splatoon 2, there is a glicko2 rating system and not the rating system that made Nintendo in Splatoon. The initial Splatfest power is 1600, 250 RD and 0.6 volatility and has 7 calculation matches. Splatfest Power level will change depending on wins or losses during Splatfest Battles. In Splatoon, At the top left corner of the box showing the player's Splatfest Power is a pair of eyes representing the Squid Sister they have sided with: players on Callie's team see scowling eyes, and those on Marie's team see more laid-back eyes. Both versions have their signature pupils, but with a dark red color instead of the usual gold. In Splatoon 2, since 4.0.0, Splatfest power is no longer displayed in Normal Mode, only in Pro Mode. However, the game still keeps track of it internally, even in Normal Mode, to determine how much a team gets for a winning bonus. Players with the highest Splatfest Power are featured in the Splatfest Top 100 challenge. The winners are announced in Splatoon at Official Japanese Splatoon Website for Japan, Live From Squid Research Lab for North America and SplatoonUK for Europe/Oceania. In Splatoon 2, the winners are announced at SplatNet 2. Players get their initial league power based on their performance in the first 7 matches. Every change of rotation resets the league power. Only the league power of the enemy team can be seen before battle. Groups that their league power is high enough will receive commemorative medals, either Gold Medals, Silver Medals, or Bronze Medals and the top 100 of the rotation are displayed in previous records. Power level of the battle is displayed in the bottom left corner, will be displayed after 10 matches in the mode. The player has power level for each ranked mode, although it is never exposed to the player until they reach Rank X. The game has a list of target power level - one for each rank. If the player's power exceeds one of these thresholds when they rank up, the game will skip them to that rank. At update 3.0.0 in Splatoon 2, Rank X was added, which is higher than S+. This rank replaced S+10 to S+50 when the update was released. The rank bar was replaced with an "X Power" level. 10 calculation matches are used for the Glicko2 initial power calculation. Your starting X Power (during your calculation period) is between 2000 and 2300. The initial RD is 250. If you end up below 2000 power at the end of the season, you are demoted to S+9. If you end up below 1900 power mid-season and you lose again, you are demoted to S+9. The promotional images for Splatfest Power show the Cats vs. Dogs and Rice vs. Bread Splatfest Tees and Ink colors despite it having not existed when they were used. Promo image for Splatfest Power. English promo for the Splatfest Top 100. Japanese promo for the Splatfest Top 100. The icon representing players in the Splatfest Top 100 on Splatnet. Callie's eyes next to her team's Splatfest Power.